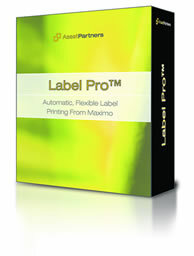 With LabelPro, you can easily create high quality labels from within Maximo. Maximo generates the labels with a single click for single Maximo records or groups of selected records. To add smart labeling capabilities to Maximo with LabelPro, simply specify the address of your network label printer (such as a Zebra, Intermec, Eltron, Toshiba or other label printers) and customize the label templates for each type of label that you want to generate. Dozens of bar code symbologies are natively supported, so you can pick whichever bar code format you want to use. No matter what printer manufacturer you use, Label Pro injects support for IF / THEN / ELSE conditional programming into the label design, so that you can build a single smart label for each application that varies appropriately based on Maximo record data. 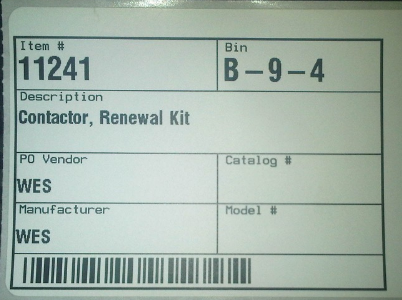 For example, a calibration label may show the test results for a passed calibration test and a “No Pass” warning message on the label when printing for a failed test, a PO receipt label may include stock information if it’s a receipt to be stocked in an inventory bin and “Deliver To” information if it’s a direct issue on receipt to a work order or facility location. The result is that your users don’t have to pick label designs for each business case, they can simply click once to print labels and let Maximo generate the correct label layout with the appropriate data and bar codes. Special label printing dialog for PO receipt labels so quantity of labels needed for each receipt can be easily specified. Users can print labels from List screen (for all selected records) or from Main record screen. Associate any number of label definitions with Maximo modules and label printers. Assign label printers and label definitions for use by only certain Maximo users if desired. Use any Maximo field variables in your label definitions. Additional Maximo fields can be referenced in label definitions by creating standard Maximo Relationships. Label printing security is maintained through Maximo’s standard User Group security settings. Adds standard Maximo function that can be called by Maximo Automation Scripts if you want to setup event-driven automatic label printing.